Something interesting happens when you remove race as the primary motivator in Shakespeare’s Othello. The play’s message about the progression of evil becomes even more universal. What was a story about a man destroying another man because of the color of his skin is now part of a larger more enigmatic narrative exploring hate, jealousy, and obsession from a less obvious perspective. It also reveals how masterfully Shakespeare wrote the nuances of human frailty. Independent Shakespeare Co. and director Melissa Chalsma explore this spin on Othello’s message by casting the company with a multiethnic group of actors. They do it regularly in their Griffith Park Free Shakespeare Festival productions to reflect the cultural make-up of Los Angeles and to make the work as accessible and inclusive as possible. Here it is particularly significant because it downplays the white vs. black struggle and instead focuses the audience’s attention on what goes on in Iago’s mind. It allows us to witness the corruption evolve from beginning to horrible end and to see these two characters not as a black man and a white man but simply as men. In this kind of scenario, Shakespeare’s words take on radically new colors, to the delight of audience members who may have seen the play before and think they know what to expect. I love watching theatre in intimate spaces like the ISC studio because when you are in such close proximity to the actors you notice all the subtleties in the characters they create. This time I was struck by how thoughtfully Chalsma directs men. She excels at orchestrating powerful exchanges with clarity and creativity while making sure the storytelling keeps the audience invested. It’s an art, to be sure. An added prologue, wherein Othello (Evan Lewis Smith) gifts the infamous handkerchief to Desdemona (Kalean Ung), establishes its significance when it later goes missing. It allows for a moment of sweetness between the lovers before Iago (David Melville) arrives to set his plan of revenge in motion. And in a word, this Iago is a worm. Melville makes the character a seemingly innocuous individual who ingratiates himself to his general while planting earworm after earworm in both Othello and Roderigo. Those seeds of deception grow until both men are systematically destroyed…and we are never given a full accounting of the reason why. Instead, we are left to figure it out for ourselves, and that makes it a fascinating study of human behavior. If you’ve ever had a conversation about what Iago’s motivation is, you know what I mean. No two people ever agree. As one of Shakespeare’s few characters of color (as written), Othello requires maturity. Smith may be young for the role but he fully embraces Othello’s stature and for the first time it felt like this was really Othello’s story. His dialect is convincing and his relationship with Ung as Desdemona is playful. As his rage escalates following the act break it is only a matter of time before the newlyweds will reach the final brutal – if somewhat gratuitous – death scene. Fiona Cheung alternates between mumbling and melodrama as Emilia. 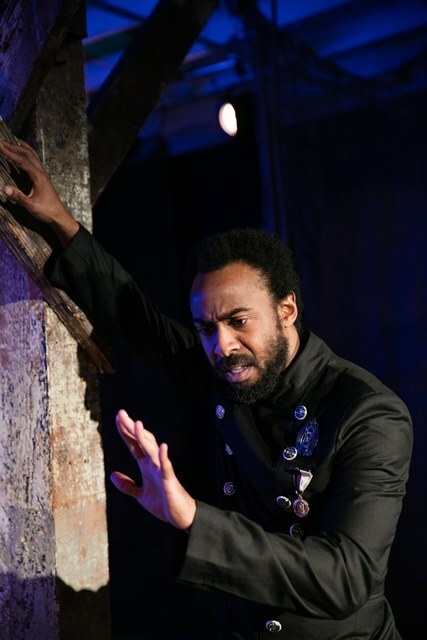 Sean Pritchett’s too-trusting Cassio is a handsome soldier whose good nature makes him an easy mark in Iago’s game. In the end, we see that it is our weaknesses that blind us. With subtlety and great finesse, Shakespeare takes every opportunity to make us think about the consequences of our actions, even as we watch Iago break Othello. This 2-hour ISC adaptation boasts two fine performances by Evan Lewis Smith and David Melville and a smart, strong staging by director Melissa Chalsma. The company’s diligent commitment to entertaining its audience makes it a great ride and an excellent precursor to their upcoming Griffith Park Free Shakespeare Festival this summer when that other villain we love to hate – Richard III – will be waiting to take the stage.